The 23rd psalm appears in our lectionary only a handful of times—but every year on the fourth Sunday of Easter, there it is. Yesterday, the fourth Sunday of Easter, is known as Good Shepherd Sunday. The readings in all three years of the lectionary focus on images of God and Jesus as shepherd, taking care of the flock. And every year we are presented with the 23rd psalm. It’s a powerful psalm, not just in its imagery, but in the emotional pull it has over many of us. It was the first piece of scripture that I memorized. My pastor at the time offered a trip to Dairy Queen for any kids who could recite the whole thing—and I got my Blizzard about a week after that first announcement. Maybe it would have happened anyway, but once I memorized the psalm, I started to see it everywhere. From TV shows, to movies, to music, Psalm 23 appears in a lot of different places. Artists, ranging from U2 to Marilyn Manson to Jay-Z, have alluded to this piece of scripture; it’s been recited in movies like Titanic, War Horse, and True Grit. If we asked people what their favorite passage of scripture is, a lot would probably answer Psalm 23 (sometimes because that’s the only reference they know of!). In the twentieth century, it came to be associated with funerals—perhaps this is because of its widespread popularity in general, since the psalm itself has little to do with death or dying. It is a great comfort, however, for those who are grieving, reminding them of the protection of the Lord through any struggle. What a statement we made yesterday! Of course, in the time since we chanted that wonderful line and my writing this post, I’ve wanted dozens of things: a nicer car, a DVR, a larger bathroom. The ads that appear along the side of my browser tell me that if I only used the right shampoo, or had the right furniture, my true worth as a person might finally be realized. And sometimes, I must admit, I take the bait. Now, nothing in the psalm says anything about not needing anything. Of course we have needs. I need shampoo in my life. With the job I have, I need a reliable method of transportation. We all need shelter, and food. And some of the wants are things we can really enjoy. The trouble comes when we start to let the wants shape our identity. Instead of being a tool in doing my job effectively or a method to visit family and friends, a car can become linked to my self-worth. And if it’s not good enough, then I’m not good enough. It’s easy for it to happen with any possession, really. And that’s what I think that first verse of the psalm is really trying to get at. I am God’s. The Lord is my shepherd, and so I am enough. The most important piece of my identity is tied to belonging to the Lord. Since my identity is grounded in that, I shall not want. I shall not struggle to define myself by what I have or what I accomplish. Of course I will still have things and accomplish various things—they just aren’t the things that give me worth as a person. Every spring, we set aside one day to celebrate the return of hope, the promise that defeat will not last forever. And we come together, dressed in our festive attire on this great day of celebration. I’m talking, of course, of Opening Day. The first day of baseball season, when everyone still has great faith that this year may be the year. Even Cubs and Mets fans give in to hope occasionally in April. Our American pastime has an almost spiritual pull on those of us it counts among its adherents. I can’t remember the first game I attended—I was too little. We went to too many games, and they all blur together in my mind. 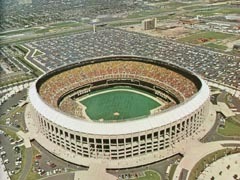 But I can remember, clear as day, the feeling of walking up to Veterans Stadium. It seemed mammoth to me as a child; apart from Beaver Stadium in State College, it was the largest building I had ever been in. If I close my eyes, I can still see the field as we emerged from the tunnel, green and bright. It was, at least in my mind, a cathedral of the game. It was no Wrigley, or Fenway, and it may have been falling apart at the seams by the time I experienced it, but my earliest memories of baseball will always be tied to the Vet. Baseball is a religion of sorts. It has rituals—the first pitch, the seventh inning stretch. Community song—the National Anthem, Take Me Out to the Ball Game, High Hopes (at for my fellow Phillies fans). It has its own canon of saints. I’ll never forget the day that my father called me at college to tell me Harry Kalas had died. He didn’t want me to learn about it for the first time by turning on the game. Baseball has its own sacred story that is passed down. Although I wasn’t alive yet, I could tell you the circumstances of the 1980 World Series win, of Mike Schmidt’s 500th, of Richie Ashburn and the Whiz Kids. Sometimes (maybe most of the time in Philadelphia), that sacred story includes lament. I’m not trying to be irreverent—at least not too irreverent—but it is very easy to see the similarities between what we do as church and what we do as fans. I think it mostly comes down to how we as humans build community. These shared experiences help us form bonds with each other. You find similar rituals not just in sports but in civic associations, Boy Scouts, Girl Scouts, even a weekly brunch club. I’ve had the pleasure of introducing my husband to the rituals of the Phillies the past several years. Already a baseball fan, he still had to learn to the special things that set our community apart: knowing when to boo, when to expect the Phanatic, why it’s called Ashburn Alley. And I made sure he knew why exactly these things were important to me. I made sure that I told him what the songs and rituals meant to me. Do we do the same as church community? Do I do a good enough job of explaining why—why the songs I learned from my parents, the rituals that have been passed down matter? Or do I hope that the uninitiated will be able to make their own meaning from the experience? If we as a church think these things matter (which I think we do) then we need to be bold about saying why. And to all my fellow Phillies fans, let us continue to pass down one of own cherished rituals: springtime hope despite all evidence to the contrary. 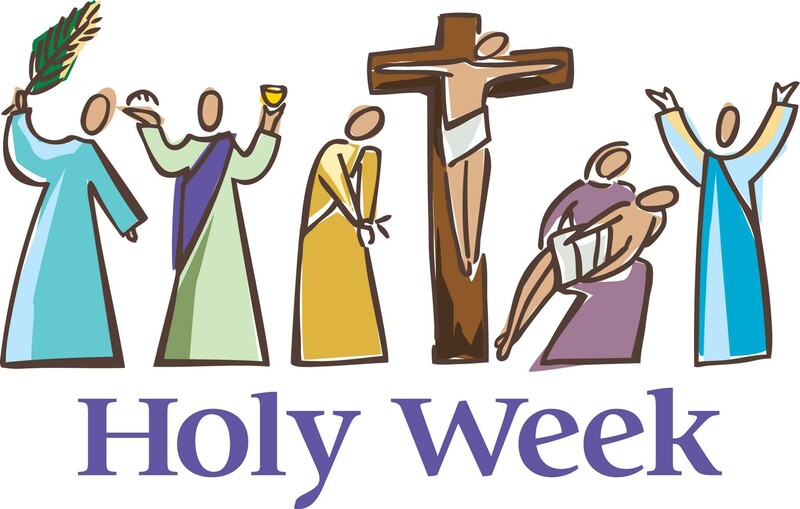 What makes Holy Week holy? Why do we call a week that remembers the suffering and death of Jesus holy? The past couple of weeks we’ve had First Holy Communion classes for the second graders at St. Paul’s. One of the ways we’ve tried to help them understand the sacrament was by breaking down the words in its title: Holy and Communion. Communion we linked to words like ‘community,’ ‘common,’ and ‘communicate.’ Holy presented another problem. Ask a group of eight-year-olds what ‘Holy’ means and you will get every kind of answer. Some said holy means God. Holy means special. Holy means something to do with church. They all had a fairly good sense of what holy is, but found trouble using other words to express the concept. I can’t say that I blame them. The textbook definition of holy is this: dedicated or consecrated to God or a religious purpose; sacred. It etymology goes back to the German “heilig” and shares its roots with the word whole. That’s kind of a mouthful for second graders, so we tried to explain by saying that holy means something that is close to God. And, in the case of communion, that holy means something God uses to show us God’s love. So what makes Holy Week holy? It is dedicated to a religious purpose; it is a means of showing us God’s love. It is our chance to enter, once again, into the story of Jesus’ life, death, and resurrection. To feel the dramatic shifts from shouts of hosanna to cries for crucifixion. It is our chance to view our own lives in light of the story of God’s love for the world. It is something that is close to God, showing us how much God loves us. Wishing all a blessed and meaningful Holy Week.